As well as being a quality tester the MS20 is a precision line-up tool, a stereo PPM, a balanced-unbalanced convertor (both ways), a stereo microphone pre-amp, a headphone amp, and a level convertor. Automated measurements can be made through the use of Lindos sequence testing. In as little as 20 seconds, the MS20 will produce a detailed analysis of your audio equipment, and present the results on the OLED display or on your PC. Measures level, frequency, phase, frequency and phase response, noise, distortion, crosstalk, path latency, headroom and wow & flutter. Bright OLED display, with 180� viewing angle. 4Hz to 40kHz digitally synthesised generator. 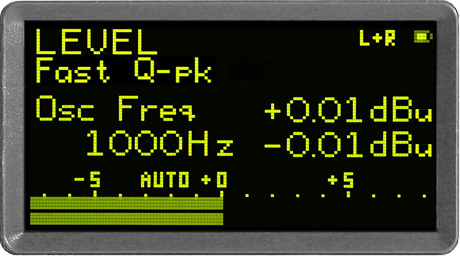 Precision two-channel level measurement with 0.01dB resolution. Noise and distortion measurement with perceptually based weighting. Lindos standard sequences for fast automatic testing. 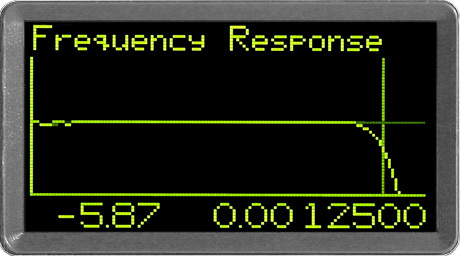 Displays graphs of frequency and phase response, headroom and noise against time. Internal flash memory storage of sequence results, user settings and presets. Built-in stereo low-noise microphone preamps. 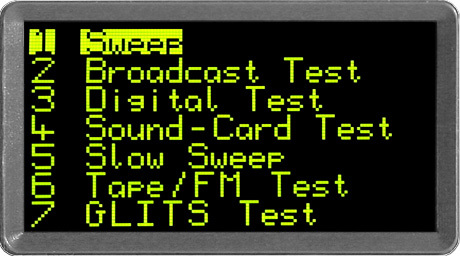 Serial computer interface for remote control. Windows support software Lin4Win included. Mains/rechargeable battery operation (15 hours) � with built-in charging. UniSon interfaces for instant compatibility with both balanced professional and single-ended consumer levels. 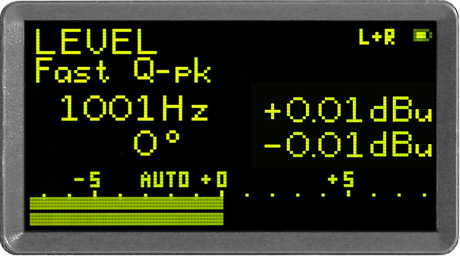 Stereo PPM display with stereo gain controlled loop-through output. Generates sine waves from 4Hz-40kHz in third and twelfth-octave steps at signal levels from -90dBu to +19dBu (balanced). Sequence editor mode for creating your own sequences with over 30 different test segments to choose from. 4 level and 4 frequency presets (user programmable). Continuously measures stereo input levels, frequency and phase. Relative measurements supported. 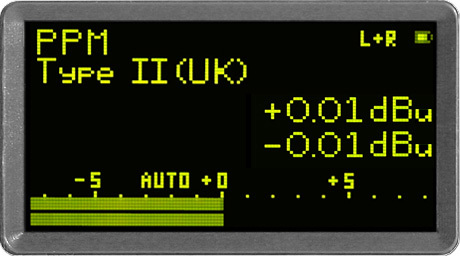 dBSPL option provided for use with Lindos calibrated microphones. 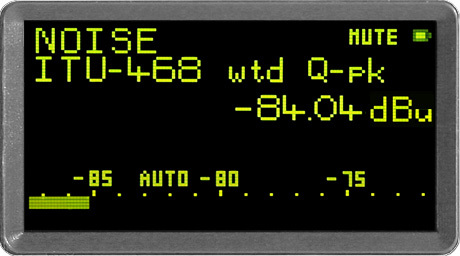 Measurements are autoranging with manual override option. Automatic sequence testing for all measurement functions with optional normalisation. Additional test segments include, channel ident tones, PPM tone-burst tests and a path latency test (delay). Up to four complete sets of results can be stored in the unit for transferring to a PC. 5s and 20s sweeps provided, (20Hz - 20kHz or 40Hz - 40kHz). A Lindos test CD, WAV/MP3 files, or any other Lindos audio test system can be used as the signal source. Lindos sequences use FSK (frequency shift keying) tones to syncronise the oscillator and measuring set over the audio path. 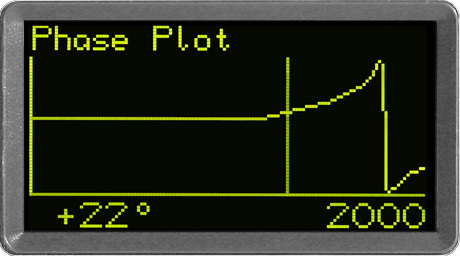 Plots phase against frequency above 1kHz. Level against level from 0dBu - +19dBu, ideal for checking levels to the IEC limit of +18dBu. Noise against time over a 20 second period, great for spotting digital errors. Features stereo PPM with fast-attack and dual-speed options for analysing signal dynamics. Stereo gain controlled loop-through output - ideal for setting levels in video post-production, or for field-recording. Complete remote control of all functions, without restricting operation from the MiniSonic�s front panel. Results management with simple cut and paste facilities for exporting text and vector graphs to windows applications. Tolerances can be applied to any set of results providing pass/fail indication on each result. Capture button that prints a single measurement line to the results sheet. This is extremely useful when testing equipment manually where results would normally be written by hand. 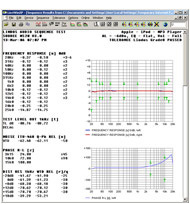 Recording controls for logging a series of measurements of the currently selected function. A graph of the incoming level against time can also be displayed for monitoring peaks on music etc. Procedure testing allows a user-defined series of measurements to be logged automatically � ideal for complex production testing. Graph options window allows complete customisation of all graphs. Ability to publish results to our online test results database or save them in HTML format for your own website. The Lindos precision calibrated electret microphones can be used in all measurement modes as well as for recording with the ultimate quality that only 1/4" microphones (with their freedom from high frequency directionality, interference patterns, and ringing) can make possible. Calibration is such that 100dB SPL reads 0dB on level +-0.5dB at 1kHz. The MiniSonic's sweep segments, with automatic triggering from the sound (no other connection needed) can be used to plot frequency response of rooms, speakers and other microphones. Acoustic noise levels can also be measured to low levels for comparing noise from air conditioning and computer fans for example.